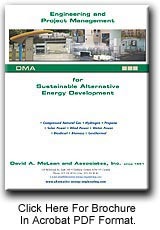 Alternative energy is the use of non-conventional energy sources to generate electrical power and fuel vehicles for today's residential, commercial, institutional and industrial energy applications. This includes emergency power systems, transportation systems, on-site electricity generation, uninterrupted power supply, combined heat and power systems, off-grid power systems, electrical peak-shaving systems and many more innovative applications. Increased energy demands have contributed to higher prices at the vehicle dispenser and at the electric meter. Cost effective, sustainable power sources provide industry and consumers with alternative energy solutions. Many alternative energy sources are renewable so the supply never diminishes. The relationship between mankind and the earth is a fragile one. With the worldwide concerns of pollution, ozone layer depletion and global warming, we need to reconsider our use of conventional fuels such as gasoline, diesel and coal. Harnessing the power of clean, alternative energy sources has become a necessity. We have a heavy dependence on petroleum products imported from around the world. Increasingly, the political stability of many of these sources is doubtful. This tends to reduce the reliability of supply and increase the volatility of the price. Alternative Energy means Energy Security.